The My Times function allows the user to navigate through the file system on the device to retrieve and display previously saved results files. The results are displayed as they have from the Time Details function on the Race Results screen. Note the results are currently automatically saved in a specific folder without asking the user to select a folder. 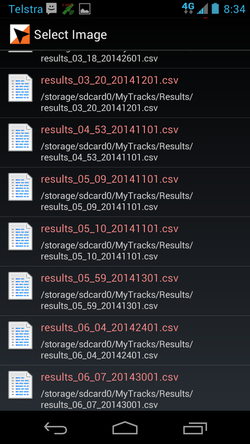 The results are currently saved with their matching GPX tracks in the folder: MyTracks/gpx.